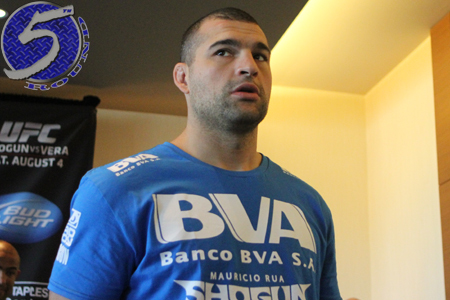 For the second straight fight, Mauricio “Shogun” Rua (Pictured) put on a thrilling show. Unfortunately for the former UFC champion, his TKO victory over Brandon Vera on Saturday night wasn’t good enough to earn next shot at the light heavyweight crown. Instead, UFC president Dana White decided to hand the top contender moniker to Lyoto Machida. This is why. Nonetheless, Shogun appeared unfazed by getting passed over for a title opportunity. The Brazilian still got back on the winning track with his 4thRound win over a rejuvenated Vera. He dropped a unanimous decision to Dan Henderson in the Fight of the Year last November.